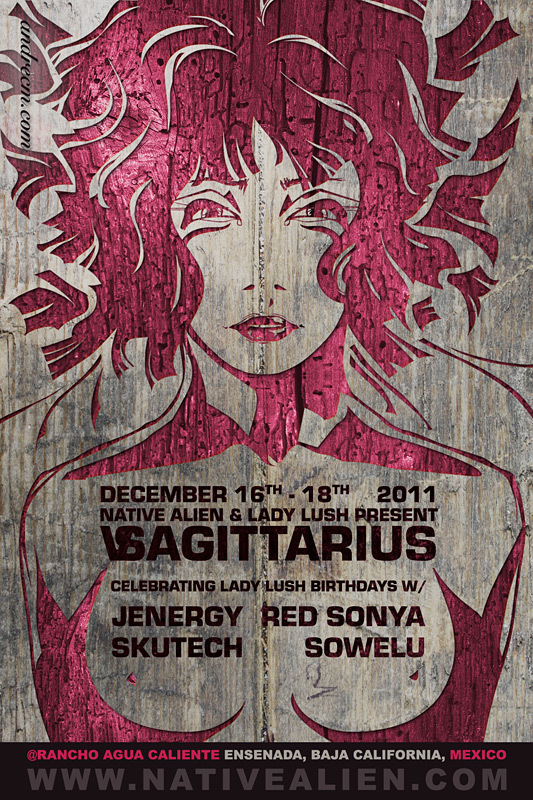 Friday, December 16, 2011 – Sunday, Dec 18th, 2011, Native Alien and Lady Lush Versus bring you “VSagittarius,” a December birthday fiesta and holiday party at the Rancho Agua Caliente hotel and hot springs resort! Join Native Alien and friends as we celebrate the birthdays of Lady Lush DJs Red Sonya and DJ Skutech, as well as Sagittarius Ladies, Jenergy & Sowelu. Rancho Agua Caliente is a two-hour drive south of the USA/Mexico international border crossing at San Ysidro and is located in the eastern valleys of the city of Ensenada, Baja California. It’s approximately 17 miles east of the port and 10 miles west of Ojos Negros. It is accessible only by a private 4 mile dirt road, and the entrance gate has 24-hour security. Check out the driving directions posted on our website for suggested driving route. Friday morning, our group caravan meets in San Diego at 10am. Follow Red Sonya and Alien Tom south of the border to Ensenada Wine Country, as they take you to their favorite vineyards and winetasting rooms on the historic “ruta del vino.” Meeting location and driving directions will be emailed to registered attendees prior to departure. You are responsible for your own transportation, and Mexican car insurance. Carpooling is encouraged. 5pm Friday, we head to a local restaurant for an early dinner. Others can meet our caravan here before heading with us to the Rancho Agua Caliente. The party continues Saturday day for a day-time BBQ and Pool Party into night-time Lady Lush Dance Party. Native Aliens are invited to either stay in the rustic hotel or camp in the designated campgrounds. Register now to join us! Hotel rooms are available, and camping is an option! Register today! Online event registration will close Wednesday, December 14th at midnight. This is private property, and pre-paid reservation is required to enter. If you have any questions at all, please don’t hesitate to contact us, or leave a comment below! Come prepared! Lights are out at 10pm, so don’t forget your flashlight! Don’t wonder around at night without it. We are in the middle of a nature preserve, so please be aware of your surroundings at all times. The facilities are limited on supplies, and the closest store is about 5 miles away. Bring most of what you will need for your stay. aaaaaaaaannhnhhhhh!– I’m so ready to get my wine and pesos on!